Bermuda is the only country she and her siblings have ever known — but she is not officially a citizen. Dercia Canto, 24, puts a human face on the often-hostile debate about PRC holders and their access to status and the right to vote. She was born here, her parents came in the 1970s and both her siblings and her daughter have status. 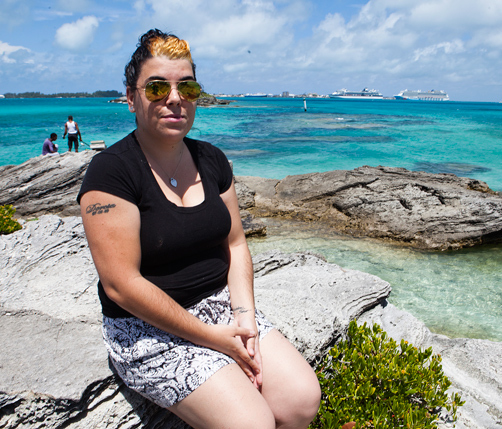 A 24-year-old Pembroke woman is determined that she will not stop fighting to obtain Bermuda status from the only country she and her siblings have ever known as home. Dercia Canto was born on the Island to Portuguese parents in August, 1989. Her father arrived in Bermuda in the mid-1970s. Her mother arrived a couple of years later with their then-three year-old daughter, who is now 36. Ms Canto’s brother was born in Bermuda in 1980 and she, in 1989. While her brother and sister possess Bermuda status, her parents are Permanent Resident Certificate (PRC) holders. Because she was born a few weeks outside of the July 31, 1989, cut off which would have qualified her to become a Bermudian, Ms Canto was granted a PRC through her father. By possessing a PRC, Ms Canto says she can apply for jobs without seeking a work permit, but feels she has been overlooked in the past because she is not considered a Bermudian. “It really bothers me because I am a Bermudian. Why can’t I have citizenship in the place where I have spent my entire life?” ponders the CedarBridge Academy graduate. But when Ms Canto lost her job due to cut backs, she soon began to see one aspect of why it would be better for her to have status. In 2006, Ms Canto gave birth to a daughter and filed for her to receive her Bermudian status but just as she was, her daughter was rejected. “But when her Bermudian father applied when she was four, the Department of Immigration granted it to her one time,” Ms Canto recalls. Recently, Ms Canto spoke of her plight at a town hall meeting organized by the Opposition. She said shortly after, she was approached by a lady who told her there’s a difference between a Bermudian and an onion.